San Juan River Village is the last neighborhood in Pagosa Springs before the Wolf Creek Ski Area. The neighborhood has an active HOA and features community water/sewer, plowed and maintained roads and fishing rights along the San Juan River and the stocked pond for property owners. This is a popular area for short term rentals because of the river and National Forest access. Contact me today for more information on the subdivision as well as active and sold listings. D. West Davies. 970-398-0022. 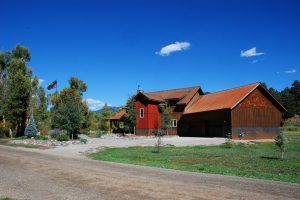 Custom home on one acre with gorgeous landscaping in river community with mountain views, oversized three-car garage (35′ x 30′), and covered patio with rock fireplace just steps from the San Juan River and National Forest. ..
By D. West Davies, Jim Smith Realty 970-398-0022.